THROUGH THE LENS ~ I see the holiday blooming quickly and winter is here. 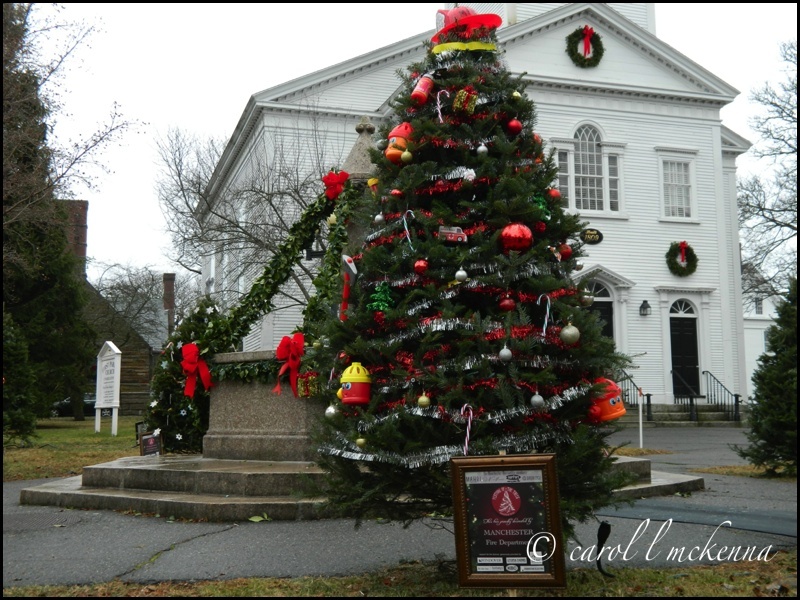 Holiday scene at Manchester-by-the-Sea MA ~ Many trees decorated with a unique theme of their business or organization. This is one of many beautifully decorated trees. New suet feeder still attracting the 'woodie family' amongst other birds. 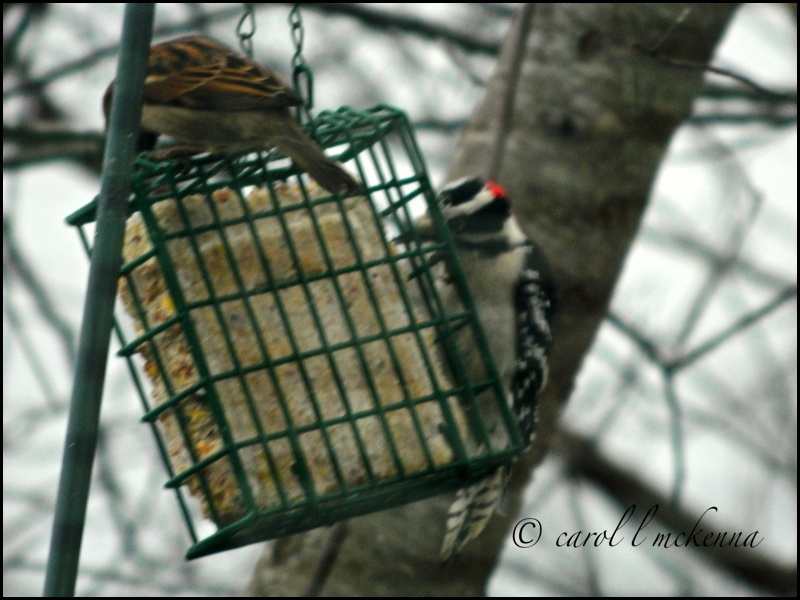 For real bird watchers this is probably not very exciting ~ This is my first foray into 'feeding the winter birds' ~ So it is a simple pleasure and hope you can enjoy the joy in the simplicity. We are wishing you the best in each day. Your posted comments are a treasure to us. Thanks. Lovely to see the birds feeding. They give great pleasure. Great set of images. I like that bird on the feeder. These birds do enjoy the pleasure of simplicity. Beautiful Christmas Tree, pretty bird and amazing silk scarf! Painting on silk must be a very pleasant hobby. Manchester by the Sea... I wanna go! It looks so festive. I haven't seen anything like that around here yet. Love the woodie on the feeder and the pretty Christmas tree. Gorgeous scarf.. Thanks for sharing, have a happy weekend! Wow Carol, that scarf is gorgeous, alcohol inks on silk? The I Heart Macro linky opens at 8pm every Sunday evening and lasts until 7pm the following Sunday so the next one can start at 8pm again. I hope that is clear. Hi Carol, thank you for coming visiting again! Lovely images Carol, your silk scarf is gorgeous-I love the colours and pattern, have a nice weekend. I love the woodpeckers that visit my feeders! They are so much fun to watch, and they are less flighty than a lot of the other birds. 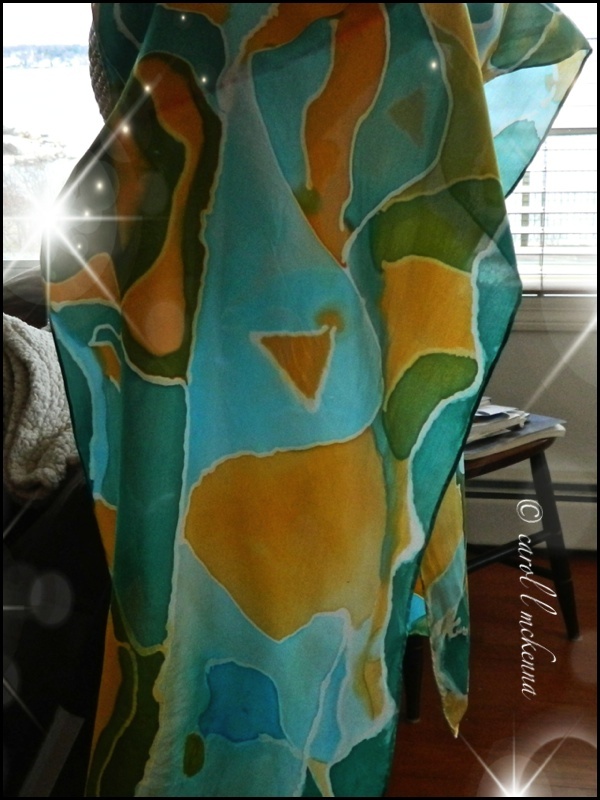 Beautiful sense of flowing, watery colours on that silk scarf. Lovely little b & w birdies! I came for the critters but glad to see all your shots. The scarf is so pretty! Hi,Carol. I like the christmas tree photo very much. Two Christmas wreaths are very charming too. Thanks for sharing. I really like your scarf! I love your silk! And, yes, the birds are tricky critters to photograph. Way too fast most of the time!!! !